A wedding is never complete without the fascinating decor on top of the cake. So today, I decided to create glittering and super easy DIY cake toppers that couples will absolutely heart. 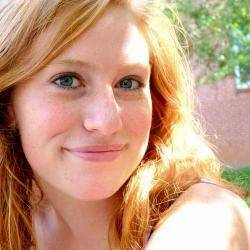 Since it is simple, you can let your kids help you and achieve it in less than an hour. First, grab the pink felt sheet. Then, fold one-third of it and cut out a symmetric heart using scissors. Then, get the ornament wire and trim about 8 inches or so. Hold the other end of the wire and poke it to the top of the heart felt. Since the fabric is soft, the wire goes in effortlessly. Then, twist the both ends to secure it. Step 1: Cut out a heart shape from the pink felt sheet. Now, it is time to coat your heart with glitter paint. 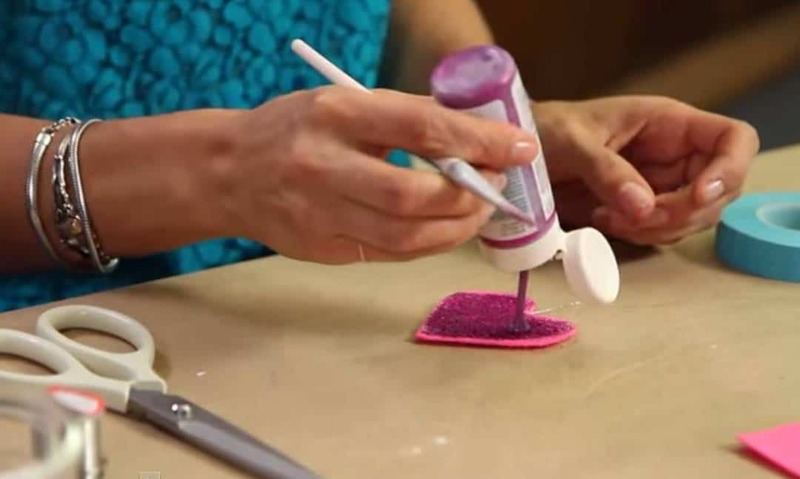 Glitter paint is suitable for this project as the glitter will never fall off and you and your guests are safe from eating them. 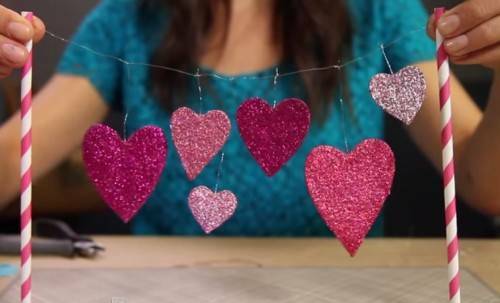 Pour a small amount of glitter paint and start painting your heart using brush. 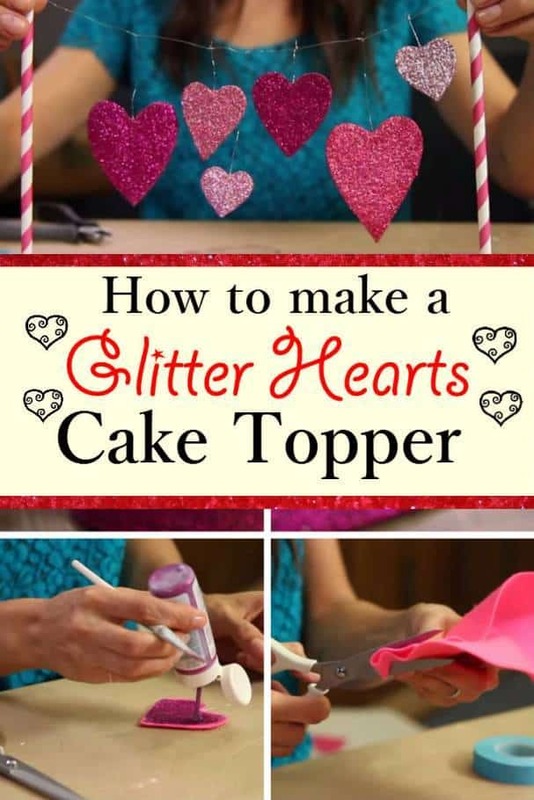 Make sure the heart felt is completely covered with glitter glue. Once done, let it dry. Step 2:Cover the heart felt sheet with glitter paint. While waiting for your glitter heart to dry, make a few hearts in various sizes. Also, poke ornament wire on each of them. If all your hearts have dried up, you can tell they have different texture. If you brush it with your fingers, there is no glitter falling off. Get the working board and ornament wire. Now, you will create a hanging line for your hearts. Tape the other end of the wire on one edge of the board and pull it towards the other edge. Then, snip it. Grab the wire of one heart ornament and slide it under the hanging wire. If you are satisfied with the position and length of the heart, fold the wire over and twist it around the rest of the wire. Then, take the other end of the hanging wire and insert it into the loop you created with the twisted wire. Pull it towards you which creates a knot. Now, your heart is tightly secured on the hanging wire. Repeat the process with the other hearts in varying lengths. Step 3: Position the heart ornament on a hanging wire and twist it around to secure it. Get the paper straws. They serve as the stands of the topper on cake. Poke tea pin through both the paper straws creating holes. Take the other end of the hanging wire and insert into the hole, then wrap the excess wire around the straw. Do this also for the other side. Step 4: Create holes on paper straw and insert each end of wire on each hole and wrap it around the straw. For the finishing touch, cut the excess wire using pliers. And you are done! Place your charming topper on your beautiful cake. I hope you have fun creating this craft. Step 5: Cut the excess wire on each ornament and position it on top of the cake.